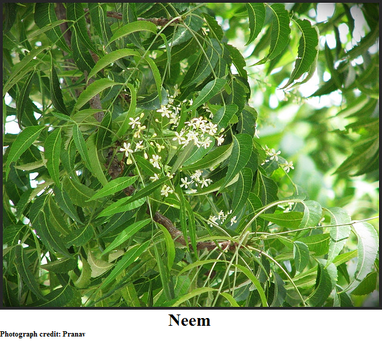 Neem is perhaps the most treasured plant in India, esteemed for its invaluable medicinal properties. Native to the Indian Subcontinent, it has been introduced to other countries in Africa, the Americas and so on. It belongs to the Meliaceae family and grows to 15-20 metres under normal conditions. Nearly every part of the tree has some benefit for humans. Mainly the leaves of the neem tree are used but the bark, seeds and less often the fruit, root and flower are used as well. Antibacterial properties of neem help in settling stomach problems, and applying a paste of neem leaves before a bath will naturally reduce body odour caused by bacteria. It is also effective in treating acne, psoriasis, eczema and other skin problems. Having a bath with water boiled with neem leaves will soothe chicken pox blisters. Neem controls excessive oil secretion and gives you glowing skin. Neem leaves are a remedy for dandruff and hair fall and act as a conditioner. Consuming small amounts of neem can boost your immunity. Neem oil in a solution of water and liquid soap makes an excellent natural insect repellent. Neem can relieve and cure one of stomach and intestinal ulcers. Its analgesic properties are an aid to relief from pain. The fruit and flower are used to treat intestinal worms. It can bring down blood sugar levels in people suffering from type 2 diabetes but must be utilised with caution. Neem is antipyretic and so reduces fever in cases of malaria. Consuming a few neem leaves every day can lessen the after effects of malarial fever on the liver. Brushing ones teeth with neem twigs will give one sparkling, cavity and plaque free teeth. It is beneficial in removing the problem of halitosis. Monitor blood sugar carefully while using neem to treat diabetes as it can cause blood sugar levels to drop very low. Excessive intake or consumption over a prolonged period of time may cause damage to the health of the human liver and kidneys. Auto-immune diseases may be aggravated by neem. Use of neem can affect fertility and should be stopped if one is attempting to have children. Pregnant women should avoid consuming neem as it can cause a miscarriage. Ingredients: 10 yam leaves, ¼ tsp tamarind powder, 10 flakes of garlic, ¼ tsp mustard seeds, 4-5 green chillies (optional), tbsp of sunflower oil, salt and sugar for taste. Preparation: Clean and shred the leaves finely and cook them. Add tamarind powder, green chillies, crushed garlic, salt and sugar. Heat the tbsp of sunflower oil in a non-stick deep frying pan and add mustard seeds. Then add the tadka (heated mustard seeds) to the yam bhaji prepared and cook it all for ten minutes. Ingredients: ¼ Kg of peeled potatoes/banana/sweet potatoes/bread fruit, 4-5 tbsp of sunflower or coconut oil, 1 cup of bread crumbs, 1 tsp of turmeric powder and salt for taste. Preparation: Cut the selected vegetable into slices of around 1/6 of an inch. Prepare a mixture of turmeric powder and salt. Roll all the slices in the mixture. Roll the slices in bread crumbs and fry them in the sunflower/coconut oil in a frying pan for 10-15 minutes. Psoriasis: Mix neem oil, cade oil and lavender oil in equal quantities and gently message into affected once or twice a day for six months to ease the effects of psoriasis. Continue if required. Eczema: Mix equal quantities of neem oil and cade oil, and apply it on affected skin in the morning. Apply neem oil alone in the evening. Do this for three months to obtain relief from eczema and continue if required.